In the early stages of a tournament you are looking to see a maximum of 15-20% of flops. Obviously this will vary depending on the run of cards you get but this is a good starting figure to have in mind. Any premium hands we are obviously going to play so AA, KK, QQ, AK. With our premium hands we are going to be aggressive when we do enter the pot with a raise or a re-raise with the aim of playing the hand against one single opponent (as previously discussed the odds of winning become significantly less playing against more than one opponent). If our aggression causes people to fold then so be it, that is a better outcome than playing a multi-way pot and it going wrong. It’s hard to get away from premium hands so the potential to lose big in a multi-way pot is as large as winning big. The following marginal hands JJ, 10-10 and AQ you can play if the situation is right. By that I mean that you are in middle or late position and there has not been any serious betting before you have acted. With these hands you still should play aggressively and enter the pot with a raise, but play the hand cautiously, always question whether you are in the lead or not, and at the first sign of strength or resistance by an opponent, retreat and wait for a better opportunity! Premium hands are very strong and have a good chance of winning, but it is often difficult to win a big pot with them unless an opponent has another strong hand at the same time. We need to increase our chip stack during the early stages, preferably with a double up or two (or three etc.) so we do need to add a few speculative hands into the mix to try and supplement the efforts of our premium hands. By speculative hands I mean hands that have the potential to make monster hands that can be disguised and win big pots. We are looking to make a straight, a flush, or a set of trips (three of a kind). So we would be looking at low to mid pairs, 2-2 through to 9-9, and cards that are connected and suited so for example 9s-8s, or Kc-Qc, or suited cards like A-x suited that have potential to make the highest (nut) flush. You should only play speculative hands when it is cheap, in a multi-way pot, and in late position. Only when it is cheap because we want to get to see the flop for as little as possible to see if we connect or not, if not we are getting the hell out of there without putting any more chips in. In a Multi-way pot because the whole reason we are playing these speculative hands is for the potential to win a big pot when you do hit (which won’t be as often) so we want to play against more players so that there is more money in the pot and so that the chances of another player making a good but weaker hand at the same time we make our monster and who will pay us off is increased. In Late Position because again we want to see the flop for cheap, and these hands are just too risky to play from early or middle position because there is too high risk that an opponent acting after us will raise meaning we would have to fold and have wasted the chips already put into the pot. The last point on speculative hands is a reminder, we are only playing to hit our monster hand. It doesn’t matter if you hit top pair or middle pair or bottom pair we are not interested and will fold to any resistance. 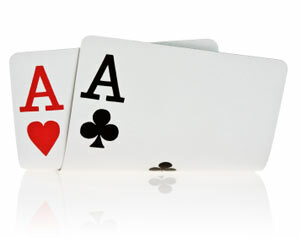 Two pair can be cautiously played, but we are really looking for our straight, flush, or trips. Ideally we want to hit this on the flop but this is unlikely, more likely will be that you hit 2 cards towards your straight or flush on the flop and in that situation you will have to assess how much it is going to cost compared to the size of the pot you could win to continue onto the turn/river to chase that final card. Don’t lose large chunks of your stack chasing these cards, preserve your chips and wait for a better opportunity. The problem with losing chips on a draw early on is that often you need a double up just to get back to your starting chip count, so be careful. All other cards go straight in the muck. Don’t even think about it, save the brain power for later, just click fold and trust me! (Yes that includes AJ and A10 before you ask! ).